LEPECVD is used to deposit high-quality crystalline silicon-germanium films on silicon substrates. A plasma is used to enhance the deposition rate, as compared to conventional conventional chemical vapor deposition (CVD). A low energy plasma is used to avoid damage to the crystal structure from high-energy ions. A tantalum filament inside the plasma source is heated by a high current, so that electrons are thermionically emitted. 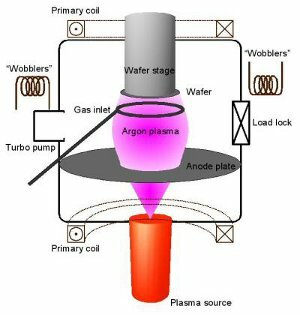 Argon gas is passed up through the plasma source into the growth chamber. A direct current arc discharge can then be sustained between the filament and the growth chamber; an anode ring is mounted within the growth chamber to stabilize the discharge. Magnetic fields (created by coils) are used to focus the plasma onto the substrate. 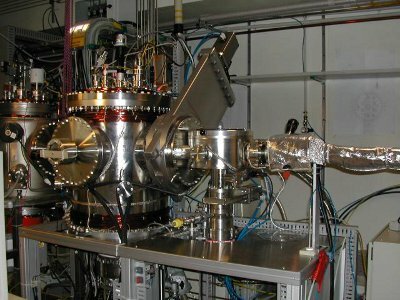 Gases which contain silicon or germanium (“process gases”) are introduced to the growth chamber, where the highly-reactive conditions fostered by the plasma cause the material to be deposited quickly and efficiently onto the substrate. This means that growth rates can be controlled by varying the plasma density and amount of process gas, independently of substrate temperature. This gives great flexibility and control in the deposition of high-quality material.